One of the most universally hated recommendations by veterinarians is that their client’s pet wears an Elizabethan collar, also known as “that lampshade thing”. I was discussing post-spay care with a client on Tuesday and she asked me if I thought it was realistic to expect her puppy to wear the collar for the necessary 10-14 days following the surgery. I replied with a very assertive “yes” and explained what can happen if the puppy is allowed to lick at her incision. If a dog or cat is constantly licking at a surgery site this will cause the incision to open and become infected. Treatment consists of a course of expensive antibiotics, twice daily warm compresses, multiple recheck appointments, prolonged e-collar use and possibly surgery to remove the infected tissue and repair the incision. 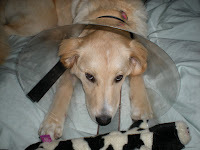 The simple act of using an e-collar saves the owner money and spares their pet unnecessary discomfort. I understand my clients’ disdain of e-collar use but it was not until I performed Poppy’s spay surgery on Tuesday that I truly appreciated what I was asking them to endure. Poppy is usually somewhat of a disaster around the house but with the addition of the e-collar she has been upgraded to a level 5 hurricane. In the past 24 hours she has flipped over multiple water bowls (full of course), scraped my arms and legs to shreds, figured out a way to trap the cats between the e-collar and the floor so she can “play” with them and sent Sparkle and Lilly into hiding under the bed. As tempting as it is to just take the e-collar off and do my best to keep an eye on her, I have seen too many complications arise from this. I know that if I can tough it out for eight (yes, I’m counting) more days then I will be done with it. The good news is wearing the e-collar hasn’t slowed Poppy down one bit, the bad news is I am having a very hard time keeping her quiet so her incision can heal properly. My dog is stuck in the cone long-term (he has allergies and chews his feet) and the "comfy cone" has relieved much of his, and my, anguish. The hard plastic cone was irritating the skin on his jaw line. This one is soft nylon-covered foam. It's much more comfortable, but if it's not secured with a collar he can wiggle out of it. 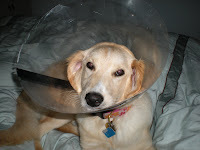 I had to laugh out loud with the image of Poppy trapping her "furmates" with the cone! She's so smart!